Ripple Rock Racers Honda CB350/360 Twins and 350F/400F Billet Triple Bottom Clamp Kit has a machine carved design to create a custom “stepped” look. The bottom triple is double bolted on each side and is increased in thickness for strength (1 1/2 inch billet). The bottom triple also has the “spacer” machined into it so there is no need for an additional spacer washer to fit the tapered roller bearing. Bottom triple clamps are fitted with All Balls Tapered Roller Bearing and hollow steel machined steering stem. Billet 4 bolt bottom triple comes complete with SS bolts and top and bottom tapered roller bearing kit. 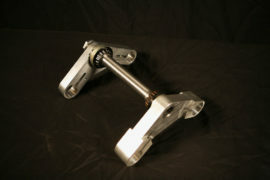 Honda CB350/360T and 350F/400F Bottom Billet Triple Clamp Kit $459.99.